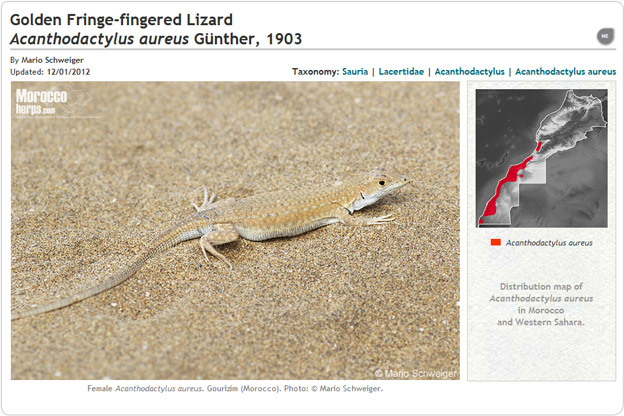 0 comments in this post Published by jgallego in Fichas, Reptilia, Sauria | 31/01/2012 1:12 . 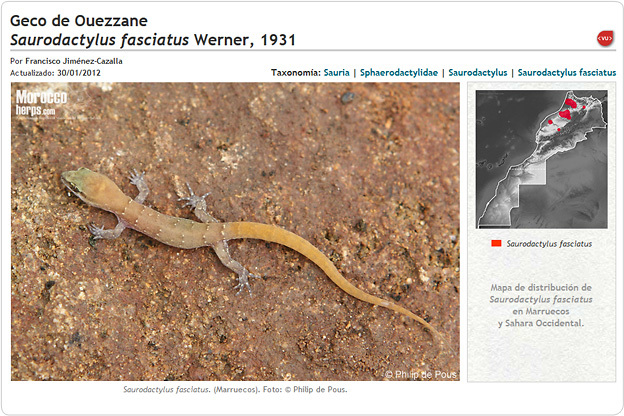 More information in the Saurodactylus fasciatus species page. 1 comment in this post Published by jgallego in Amphibia, Anura, Fichas | 28/01/2012 19:10 . 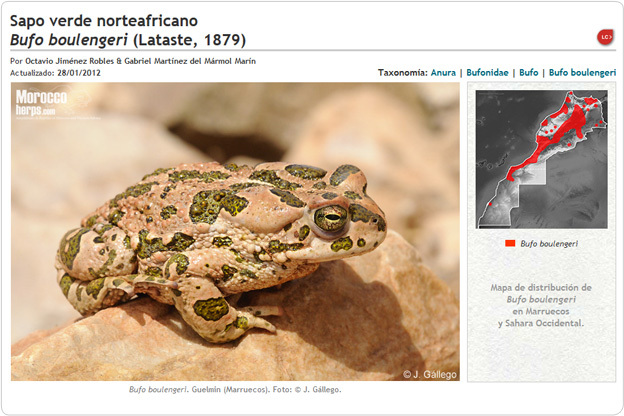 More information in the Bufo boulengeri species page. 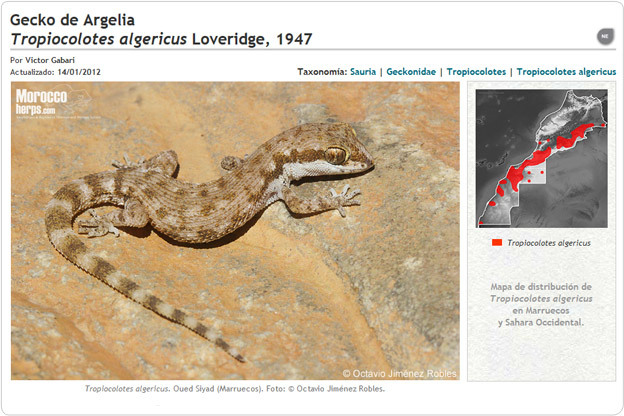 1 comment in this post Published by jgallego in Fichas, Reptilia, Sauria | 25/01/2012 12:04 . More information in the Mesalina rubropunctata species page. 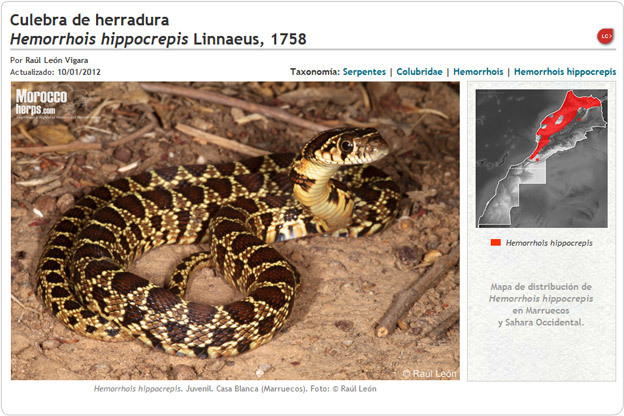 1 comment in this post Published by jgallego in Fichas, Reptilia, Serpentes | 21/01/2012 0:25 . 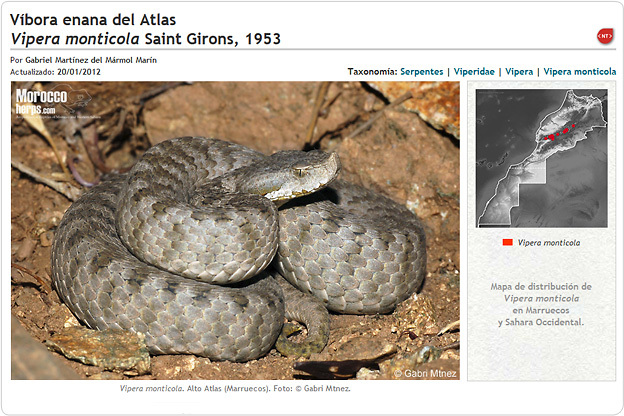 More information in the Vipera monticola species page. 0 comments in this post Published by jgallego in Fichas, Reptilia, Sauria | 19/01/2012 2:20 . 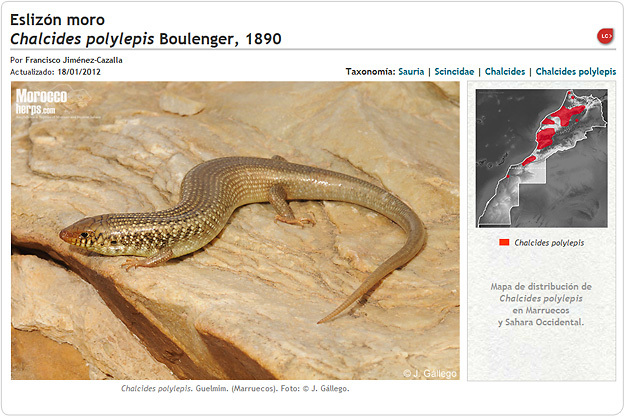 More information in the Chalcides polylepis species page. 1 comment in this post Published by jgallego in Fichas, Reptilia, Sauria | 16/01/2012 2:45 . 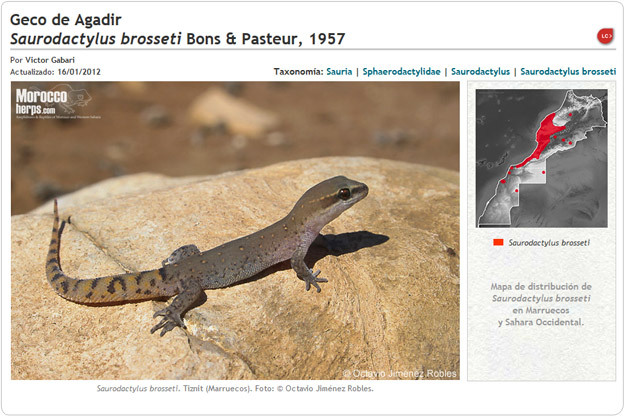 More information in the Saurodactylus brosseti species page. 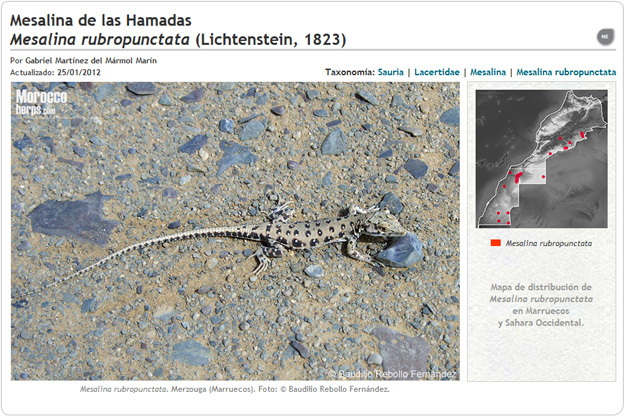 1 comment in this post Published by jgallego in Fichas, Reptilia, Sauria | 14/01/2012 2:03 . More information in the Tropiocolotes algericus species page. 1 comment in this post Published by jgallego in Fichas, Reptilia, Sauria | 12/01/2012 18:01 . More information in the Acanthodactylus aureus page. 1 comment in this post Published by jgallego in Fichas, Reptilia, Serpentes | 10/01/2012 19:04 . More information in the Hemorrhois hippocrepis species page. 1 comment in this post Published by jgallego in Amphibia, Fichas, Urodela | 08/01/2012 21:00 . 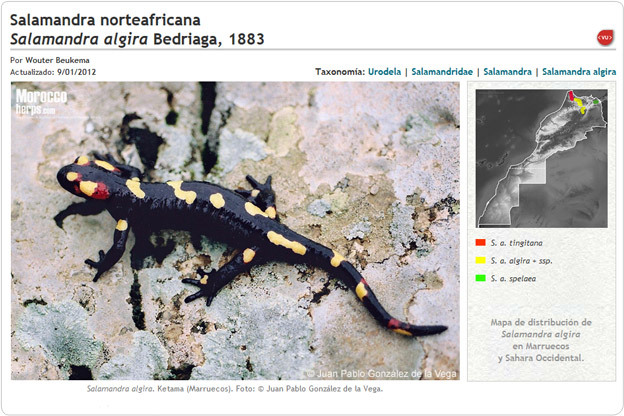 More information in the Salamandra algira species page.